Home » Articles » TIRADS ACR : What radiologists need to know! TIRADS ACR : What radiologists need to know! TIRADS examples with scoring: Test yourself! With the advent of high-resolution ultrasound, the number of thyroid nodules being detected is increasing. Most of these nodules are benign. Even the smaller malignant nodules have an indolent course . Also, the mortality associated with papillary thyroid carcinomas has remained low. Hence it is essential to evaluate which of these nodules actually need a fine needle aspiration cytology (FNAC)/biopsy, which is the most effective method currently to diagnose whether a particular nodule is worrisome. Unnecessary biopsies can result in a burden on the healthcare system without significant benefits . What is TIRADS / ti rads / TI-RADS and what does it stand for? TI-RADS stands for Thyroid Imaging Reporting and Data System. It is a reporting system for thyroid nodules on Ultrasound formulated by the ACR, akin to BI-RADS developed for breast ultrasounds. It consists of guidelines regarding whether a thyroid nodule should be followed up on ultrasound or to should be biopsied. Different variations of the TI-RADS classifications and recommendations are available, the most commonly followed one is the ACR TI-RADS. A recent study published in AJR confirms that the ACR TI-RADS system performs well as compared to other scoring systems . Develop management guidelines for nodules that are discovered incidentally on CT, MRI, PET or ultrasound. Produce a lexicon to describe all thyroid nodules on sonography. Develop a standardized TI-RADS risk-stratification system based on the lexicon to inform practitioners about which nodules warrant a biopsy. The guidelines have been described as per the ACR TI-RADS 2017 white paper. The full text of this article is available here: ACR TI-RADS white paper 2017. Thyroid nodules are evaluated on certain sonographic criteria, each criterion is allotted points which are summed up and then each nodule is categorized in one of the above-mentioned categories, depending on the score. * Spongiform nodule should be composed predominantly (>50%) of cystic spaces. # “Large comet-tail artifacts” are defined as echogenic foci with V-shaped echoes >1 mm deep to them. $ Punctate echogenic foci are non-shadowing. Doppler has not found to be useful in distinguishing benign from malignant lesions, however, the presence of vascularity rules out debris and hemorrhage which are inconsequential . The presence of “halo” is not specific and is not included in the lexicon. White knight: Uniformly hyperechoic nodule. Giraffe hide: Mixed hyper and hypoechoic areas. Nodules should be measured in three orthogonal planes. If there are multiple nodules, not more than 4 nodules should be documented. More than 50% increase in volume. It is important to compare not just with the immediate previous studies, but with the previous ones as well. Number of nodules to biopsy: If multiple nodules are present, biopsy two nodules with the highest score, which may not necessarily be the largest nodules. Suspicious nodes if present should also be biopsied. Punctate echogenic foci that may represent microcalcifications. TIRADS atlas: ACR TI-RADS Atlas with images for reference for each category. ACR has made these excellent videos publicly available on YouTube for reference. Following topics are covered in these videos. Technique: Ultrasound examination of the thyroid and adjacent soft tissues was performed. Go through the categories once again , use our TIRADS calculator and test yourself! What is the TIRADS score for this nodule? If you got these wrong revise the guidelines here again. ACR TI-RADS Atlas with images for reference for each category. Thyroid Imaging Reporting and Data System (TI-RADS): A User’s Guide : A radiology article for reference. Tessler FN, Middleton WD, Grant EG, et al. 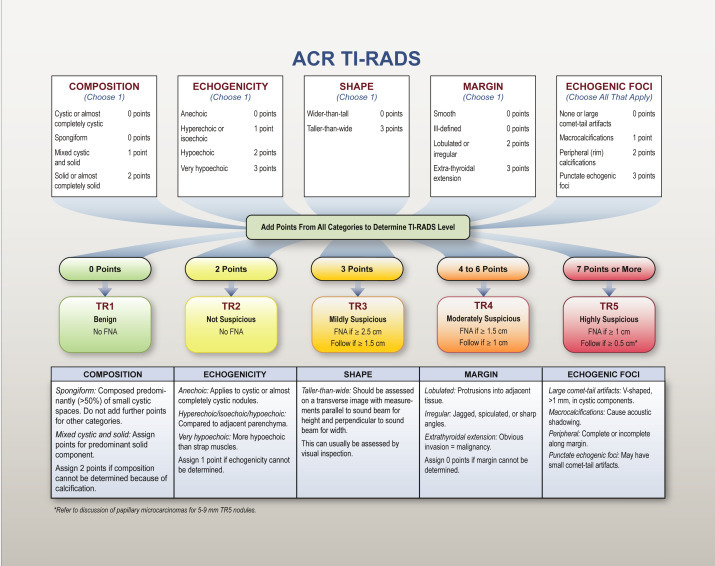 ACR Thyroid Imaging, Reporting and Data System (TI-RADS): white paper of the ACR TI-RADS committee. J Am Coll Radiol 2017; 14:587–595. Middleton WD, Teefey SA, Reading CC, Langer JE, Beland MD, Szabunio MM, et al. Comparison of Performance Characteristics of American College of Radiology TI-RADS, Korean Society of Thyroid Radiology TIRADS, and American Thyroid Association Guidelines. AJR Am J Roentgenol. 2018;210(5):1148-54. More posts on reporting systems coming soon! More radiology resources here: Radiology resources! Disclaimer: Content used in this article is from freely available online resources and has been referenced appropriately. Videos by ACR are hosted on YouTube and are free to be shared. If you have any copyright issues you can contact us and we shall modify the content accordingly.